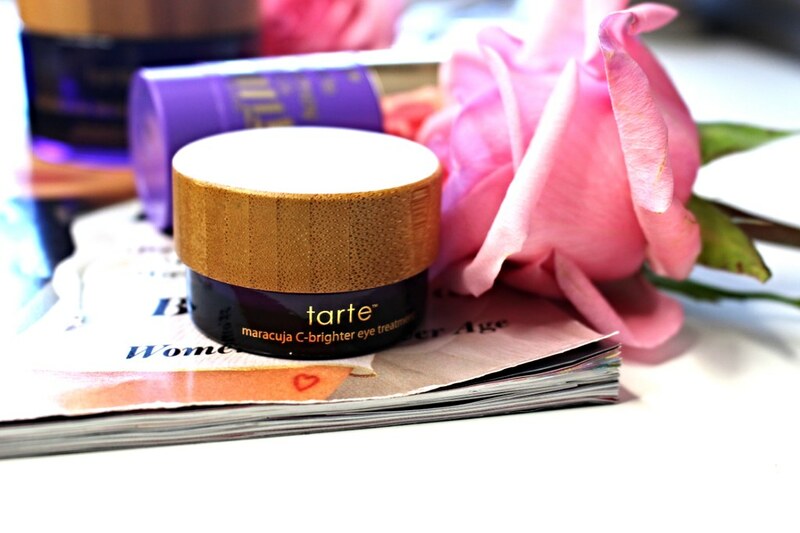 You know that Tarte has awesome makeup, but did you know they have an amazing skin care range too? You know I’m all about skin care, because beautiful makeup starts with beautiful skin. No doubt about it! 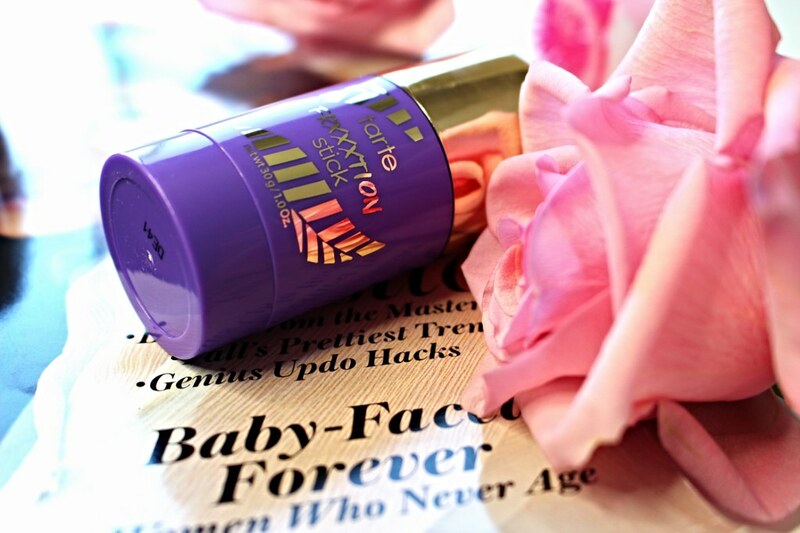 If I’m looking to exfoliate my skin well, I use the FRXXXTION Stick Exfoliating Cleanser. It’s a three-in-one exfoliator, cleanser, and face mask all in a stick. As you apply it, it exfoliates the skin, and it smells fresh and light. This product draws out the oil and helps to reduce shine, which is amazing for someone with my oily skin type. Because it’s exfoliating, it’s also getting rid of the surface cells. I also love how radiant my skin looks after the usage of this product. This is such an excellent all in one product. 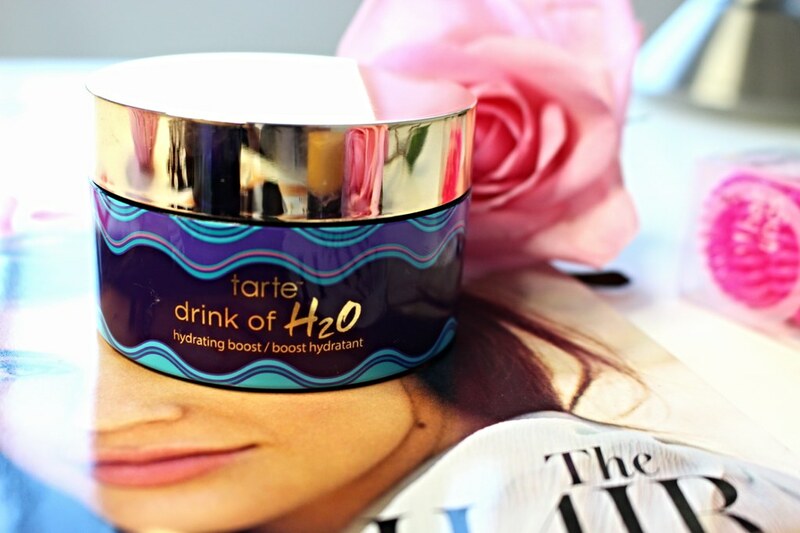 The Tarte Rainforest of the Sea™ Drink Of H2O Hydrating Boost is one of my favorite moisturizers. Most importantly, I love the way it feels on my skin. 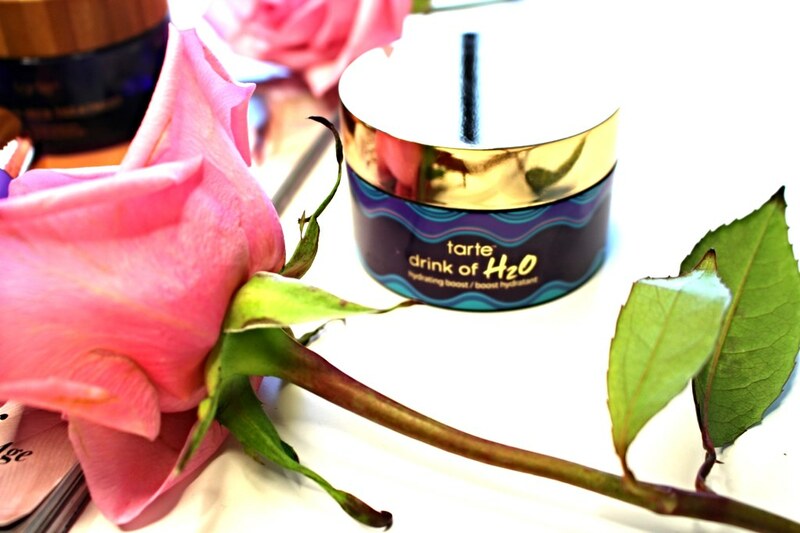 This is for dry, dehydrated skin to help your skin regain its needed moisture. This is a water gel, and it feels like one without having a thin formulation. I just love how creamy it is, and it is has a cooling component to it. The next morning, my skin looks absolutely incredible in terms of the brightness and the dullness seems to be gone. This product is described as being a balancer of skin oils, and that’s one of the main reasons I love using it. 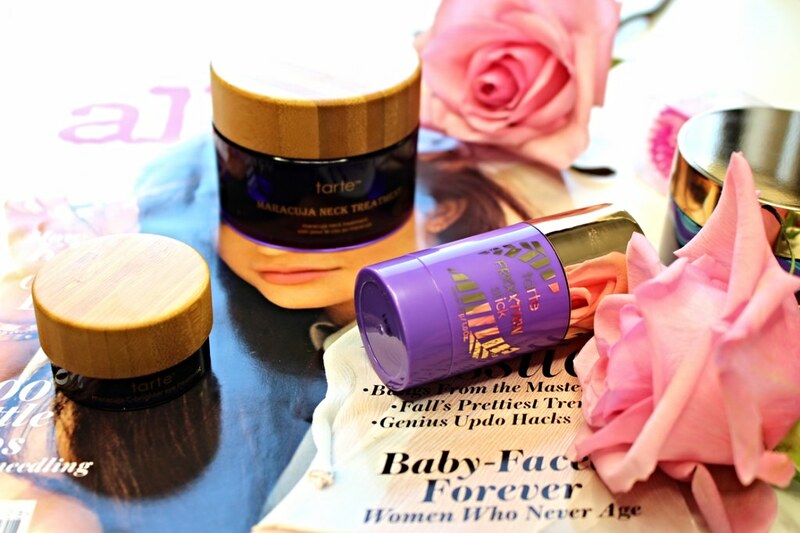 It’s also a great helping hand with making the skin appear more firm, toned and bright. 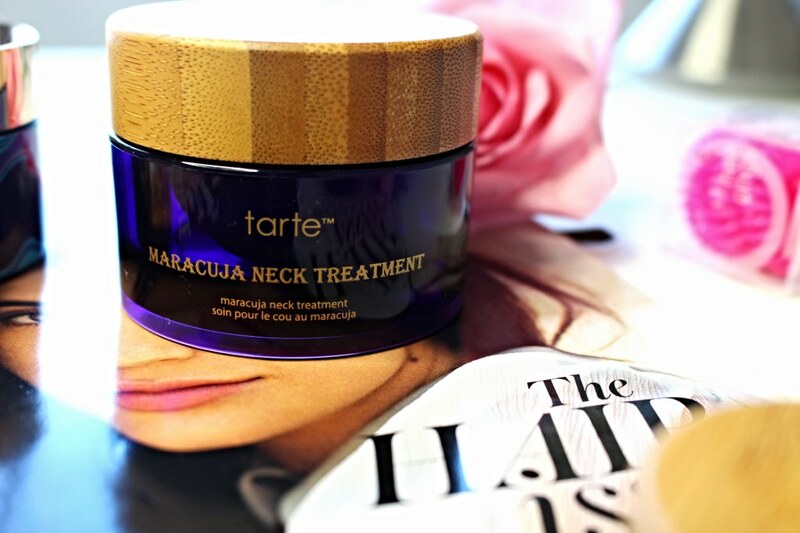 After applying the hydrating boost on my skin, I apply the Maracuja Neck Treatment to my neck. This beautifully luxe cream is made to help improve the appearance of skin on the… (shocking I know) neck. Most of us found out recently that you’re supposed to apply moisturizer to your neck too, and this often neglected area needs a different type of moisture because the skin is thinner and more delicate than elsewhere on the bod. The formula helps promote cell regeneration and skin elasticity while reducing appearance of fine lines, wrinkles and sagging – can I get a hell YEAH? We all need to lessen that sag and drag on the neck. 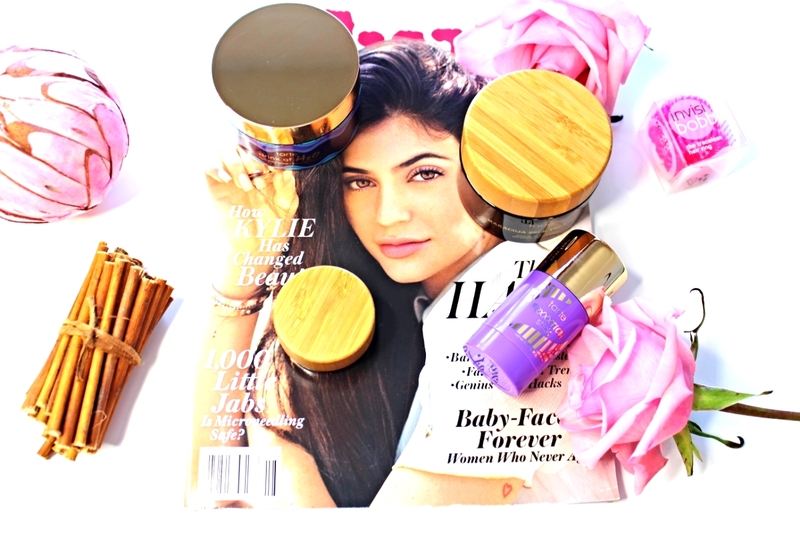 Last, but certainly not least, I tried the Maracuja C Brighter Eye Treatment. The difference between the neck treatment and this eye treatment is that this one has the C-brighter technology. The combination of aracuja fruit, vitamin C and advanced botanicals, makes this eye treatment the best for brightening and hydrating that delicate area around the eyes. The oat sugars help to smooth and tighten the skin, but this formula truly feels hydrating and so cooling on the eye area. Have you tried any of these? Which sounds like your favorite? Disclaimer: Sometimes I am lucky enough to receive products as PR samples. This post was not sponsored, and I have no obligation to share this product range with you. As always all thoughts and opinions are honest and my own.